I think that no matter whether you've just bought your first iPad or iPhone or you already had them for a long time, a little refreshing will be quite a nice deal. It is useful to know how to print files and pictures directly from your device. 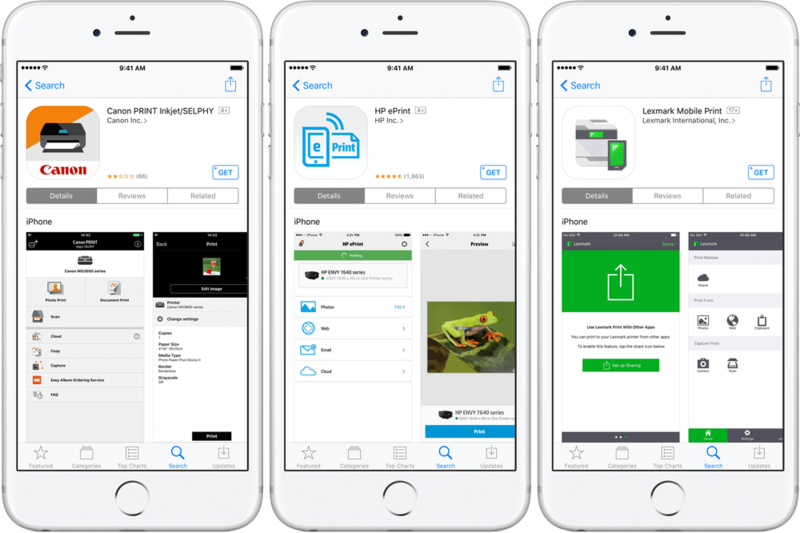 Here are a few options of how you can print directly from your iPhone and iPad. The fastest and easiest way is printing via AirPrint. It is Apple's built-in into iOS protocol that can be connected to the majority of printers on the market. If you don't sure whether your printer supports AirPrint, don't worry. Keep reading this manual and you'll learn how to find it out. In case your printer doesn't support this option, use an alternative way, I'll tell about it a bit later. Maybe it is the right time to purchase another up-to-date printer that supports AirPrint? I'm joking, right. But this may be a pretty nice idea for some people. ;) Some Canon and HP printers with the AirPrint support cost around $45 on the Internet and this is the cost of refilling the ink in an old one. One more thing to remember (before we start) is that it is a wireless option, so, you won't need to connect your iPhone or iPad to the printing device with cables. No more wires mess. That’s why I’m fond of the wireless connections, everything is so clear and smooth. The process is nearly the same for iPhones and iPads. The only difference is where the share button is (it is a button with a square and an arrow on it). It may also move depending on the mode you are using: a portrait or a landscape one. Here are some examples with my iPhone 7 Plus. This is how the button looks like in the Photos app. Tap the share button in the upper right corner, if you are using a landscape mode or find it in the lower left corner, if you are using a portrait mode. On the next screen, check all the photos you want to print. You can swipe further to choose more images or print the first one. When you have selected everything you need, choose 'Next' at the top right. Now select 'Print'. If you don't see this option, swipe the lower row of options and find it there. (On a newly appeared screen, choose 'Select Printer'). 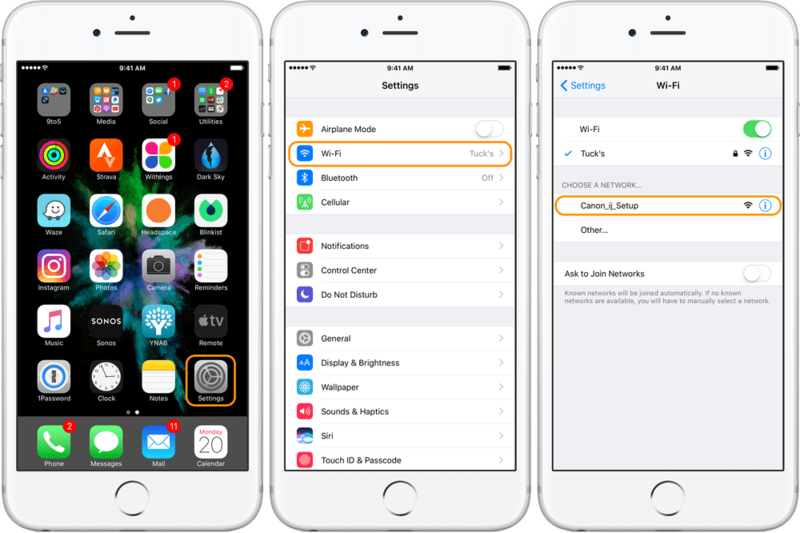 If your printer supports AirPrint and is connected to a Wi-Fi network (it should be one network for your iPhone or iPad as well), you will see your printed appeared automatically. Choose it and you’ll notice the option of increasing copies or toggling to 'Black & White'. When you see the share button on your device's screen, it means that you can print photos and materials directly from it. 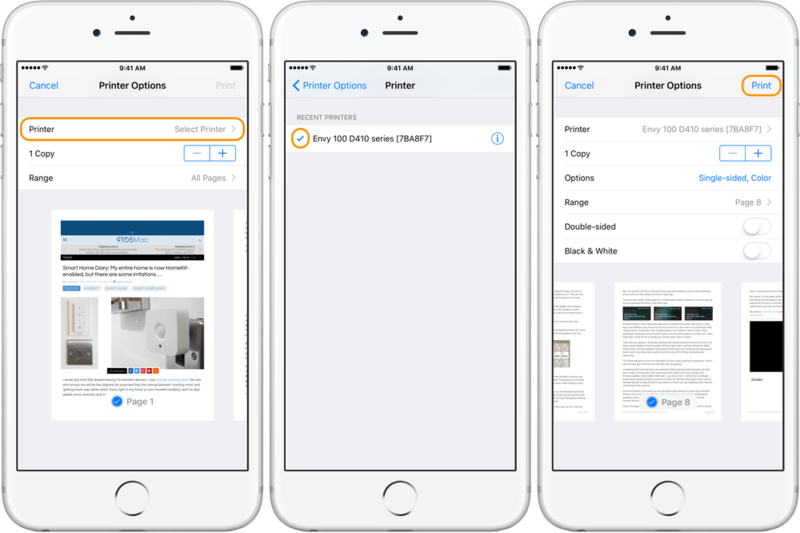 If your printer doesn't support AirPrint, you still can print your files from an iPhone or iPad. Remember I told that earlier? Let's dive deeper into the details. The easiest way is to connect to it via its wireless access point. The majority of nowadays printers have such an option. The button should look similar to one pictured above. After you've pressed this button, open 'Settings', 'Wi-Fi' and search for an open network with your printer's name. Usually it is named as a specific printer model. For instance, my Canon printer allows me to print files and photos wirelessly via the ‘Canon_ij_Setup’ network. Note, that there is a special Canon app allowing to do that. Maybe I won't open a secret to you that most of manufacturers offer special apps for iPhones and iPads to make the printing process more comfortable and understandable. ​If you don't like these 2 ways describes above, you still have an alternative. Third-party apps may help you. I know various applications like Printopia, handyPrint, Printer Pro, but personally I prefer to print via AirPrint. However, you can check out what people on social ​media share. Live reviews can be helpful. Or, ask your friends what means they use for that purposes. I think that getting real people’s reviews is the best way to find out what to use. A positive side of all these apps is the vast functionality. They offer more opportunities for printing that built-in iOS features. One more (not very popular, however, it exists) option is using Bluetooth for printing files from a mobile device. Not many printers support such an option, but check yours, maybe there is one. I hope my article was useful and now you are aware of all the possible ways of printing. If you have some questions left, please write them in the comments, you can even ask for some help with a specific printer and we will help.